It’s so important to keep your kitchen clean and germ-free! Help protect your family from harmful foodborne illness with BioArmor™ H2O2 Plus Disinfectant Cleaner, a multi-purpose EPA-Registered disinfectant cleaner powered by hydrogen peroxide that kills 99.9% of germs while it cleans. Disinfecting your kitchen on a regular basis should be an essential part of your housekeeping routine. Irregular cleaning of food preparation areas can leave you susceptible to dangerous bacteria like salmonella and E Coli. Kitchens, therefore, should be cleaned each time you prepare food, and a complete and thorough clean should be done on a weekly basis. 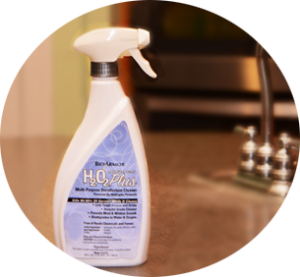 Use H2O2 Plus on countertops, sinks, stovetops, and more to help keep your kitchen healthy and clean. No one likes to bathe in a tub that hasn’t been cleaned, yet how many of us hop in the same shower day after day without cleaning it at all? Shower care is just as much about prevention as it is about cleaning. Even if you keep your shower dry, it’s inevitable that some moisture will remain. Help protect you and your family from mold, mildew and germs in your shower with EPA-Registered BioArmor™ H2O2 Plus Shower Cleaner.